Elmira College clear stemless wine glass with Elmira College logo on the front in purple writing. Elmira College Black Water Bottle with Elmira down the side. Elmira College stainless steel drinking cup. Elmira College Gray Water Bottle with Elmira down the side. 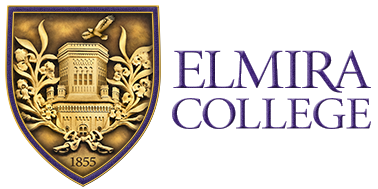 Elmira College Purple Mug with Elmira Logo on the Front. Elmira College Travel Mug. Top half is purple with "Elmira College" in gold. Bottom half is silver.